Frank Jackson, a highly recruited player out of powerhouse Lone Peak High School has committed to play his college basketball at Duke. Jackson had originally committed to BYU early on. However, he got better and better as his high school years progressed and more schools began to take notice. 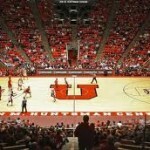 He had also been recruited by the University of Utah. You can check out the full story in the link below from Brandon Gurney of the Deseret News. Congratulations to the young man as he’s gonna play for one of the best programs in the country. If you’d told me the all-time leading scorer for BYU basketball would be on the free throw line late in the game to ice a win against the #3 team in the country – and miss both free throws – I would have told you you’re crazy. And that BYU would go on to win anyways, I’d say you’re even crazier. That’s precisely what happened. BYU hung on to beat #3 ranked Gonzaga in Spokane, despite two uncharacteristic misses from Tyler Haws with under a minute to go. The triumph was clearly one of BYU’s best wins in a long time. The win also gave Cougar fans something to cheer about again this year. 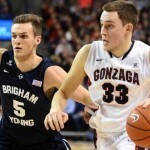 It remains to be see if the Gonzaga upset is enough to propel BYU into the NCAA tournament. The win does at least give the Cougars some momentum heading into the WCC tournament. BYU needs to likely advance to the final of the WCC tournament (in which they would presumably rematch Gonzaga) to keep their tournament hopes alive. Whether they need to win that rematch or not is an unknown. Regardless, it’s safe to say BYU is certainly playing some good basketball right now. The Pac-12 may be down a bit this year but the Utah Utes are off to an unbelievable 3-0 start in conference play. Their nearly 30 point thrashing of Colorado last night was essentially their 3rd such win in a row to begin conference play. Say what you will about the conference but it’s still the PAC-12 – full of future NBA players. And Utah is making people look silly. The games are not even close! Colorado is clearly one of the better teams in the Pac-12 this year and Utah handled them easily, 74-49. What Larry Krystkowiak has done is nothing short of miraculous. I saw a Tweet yesterday that reminded us all that Utah lost to Colorado in their innagural Pac-12 basketball game 73-33 in 2011. That year they went 3-16 in conference play. Now, 3 seasons later, it looks like they may not lose a conference game and they are ranked #9 in the country. Many a Ute fan will remember that it wasn’t long ago that Utah Hoops was completely irelavent in the state, except for Jimmermania’s annual visit. 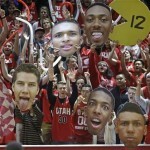 Utah basketball has a new pre-game intro that is pretty incredible. They unveiled it for the first time on Friday for their game against USC. They did the same this afternoon against UCLA. It really has a pro feel to it. It’s similar to what BYU does on the great big sheets that fall down from the scoreboard. Seeing the images on the court though might even be cooler. Well, so far so good. 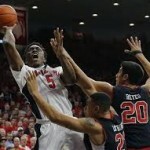 The Utes are 2-0 in conference with yet another impressive win this afternoon over UCLA – 71-39. You can tell me UCLA is having a subpar year, which they are, but demolishing the most heralded program in the history of college basketball by 32 points is rather impressive – down year or not. Though the focus up on the hill is on what will happen with the head football coach, the Utah men’s basketball team has climbed into the top 10 of the AP rankings. Quite an accomplishment. Good link here to Kyle Goon of the Salt Lake Tribune. It’s not every day you can head out of town to watch your football team play in a bowl game, and then turn around and watch the basketball team play later that night in the same town. 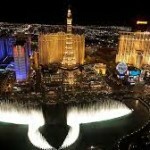 Not to mention that town happens to be Las Vegas! Utah ends it’s two year bowl drought by taking on Colorado State tomorrow at 1:30 Mountain time in the Las Vegas Bowl. Both Ute and Cougar fans are familiar with this bowl, which really is one of the better non-New Year’s games. Utah is a 3 point favorite. The game will be broadcast on ABC. 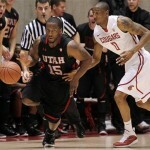 The #14 ranked ‘Runin Utes’ then take on UNLV later in the evening. The game will air at 9:30 Mountain time on ESPN 2. Though in Vegas, it will actually be played at a neutral site in the MGM Grand Garden arena. I’ve never seen a sporting even there but have enjoyed a few Van Halen concerts. Should be a lot of fun for Ute fans. The game is part of a 4 team showcase. Washington vs. Oklahoma is the other game. Utah Men’s basketball coach Larry Krystkowiak has apparently had enough of Jiggy Watkins violating team rules and has permanently dismissed him from the team. Watkins had already been suspended once this year. Jeff Eidenberg of Yahoo Sports has the details. This was the right move for Coach Krsytkowiak. Losing their best player may ensure the Utes don’t win another game this year. That shouldn’t be a problem though. No one expected them to be competitive the reminder of the season, even with Watkins. Krystkowiak had absolutely nothing to lose. He needs the team to buy into his system. Throwing a “bad apple” off the team during a 4 or 5 win season seems like a great way to get his message across without jeopardizing the long term viability of the program. Watkins was a senior and did not figure into future plans. In the span of one week, the Utah basketball team loses a game by more points than they score, hears their coach announce he’ll open try-outs to the student body and then turn around and actually win their first Pac-12 game. Go figure. 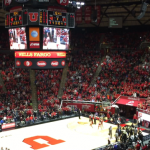 Rock bottom appeared to be last Saturday when Utah was embarrassed by Colorado, 73-33. 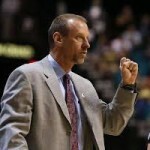 After the game, head coach Larry Krystkowiak went off on the team. Apparently he’d had some discipline problems with guys not showing up on time and instituted a zero tolerance policy regarding tardiness. Coming off the 40 point loss, we then heard that as soon as school resumes on Monday, 1/9, Utah basketball will hold an open try-out. Ok, so Krystkowiak’s not actually going to throw a bunch of 5’9” accounting majors on the roster but the team is thin enough they need some additional bodies for practice. The announcement obviously just rubs salt in what is already a pretty deep wound. Will they ever suit up in a game? Not likely but let’s be honest – someone goes down to injury or you have a few more defections like Jim Boylen did and you’ll be looking to your practice squad to fill a roster spot.